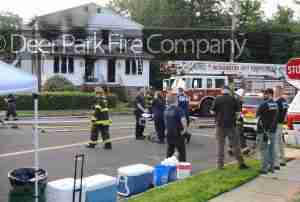 At around the 50 minute mark this morning and after a 2nd alarm was requested and dispatched Rehab 13 was requested by Command for the scene in the 200 block of Center Street in Mt. Ephraim for a heavy fire condition in a two story duplex type wood frame structure. 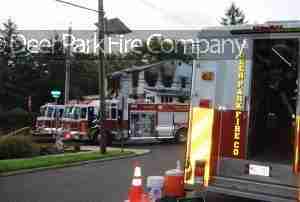 All companies were in service and at the time of our dispatch had gone defensive due to the fires progress and construction type. Rehab 13 was toned out at 0615 hrs. 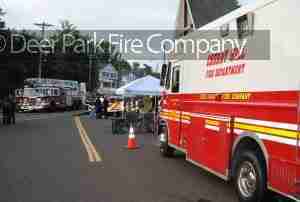 and responded with a crew of (4) and (1) one unit to the scene. 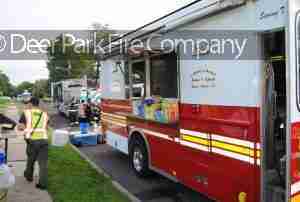 Rehab 13 set up near a Bellmawr Unit (Station 32) on a side street across from the fire building to provide liquids, cooling towels, rest room, and hot food and snack foods for the personnel on scene. Rehab 13 served (72) MVP drinks, 13 bottles of water, 4 pots of coffee, 1 pot of decaff coffee, (39) breakfast sandwiches, cotton towels, and multiple snack foods. Rehab 13 arrived on scene at 0653 hrs. and was released by command by 0853 hrs. 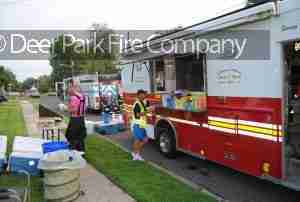 All stores and the truck were resupplied by 0945 hrs. 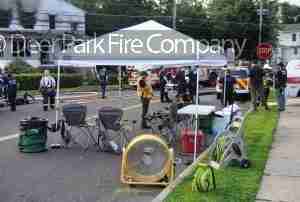 There were reports of (2) fire fighter injuries but the extent of those injuries were not known at this time. An A/B view of the fire building from our vantage point on the side street near Center Street fire location. Photos by J. Bird Rehab 13 member. Mt Ephraim EMS rest and recovery area set up prior to our arrival. 1st due units with the fire building in the background. Rehab 13 set up near the Mt. Ephraim EMS rest area that was established. 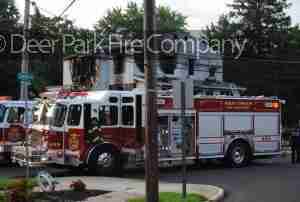 Gloucester City Quint 51 on the scene as were other mutual aid units during the fire.